Celebrate the 20th anniversary of this enchanted classic, now for the first time on Blu-ray! On his ninth birthday, Omri is presented with many gifts - the most unusual being a cupboard. But this is no ordinary wooden box. It is endowed with magical power that transforms Omri's plastic toy figurines into living creatures. The first miniature to be animated is a 19th Century Iroquois warrior named Little Bear, who is terrified at first by his alien surroundings but soon bonds with hisgigantic playmate. But when Omri's friend, Patrick, gets in on the act and brings a six-shooting cowboy (David Keith, U-571) to life, their fantastic secret is in danger of being revealed. The Indian in the Cupboard is terrific family entertainment from director Frank Oz (Bowfinger) and Melissa Mathison, the writer of E.T., The Extra-Terrestrial. A young boy tosses a few action figures into a magical cupboard, unlocks the door, and then opens it to find Darth Vader, a Tyrannosaurus Rex, a G.I. Joe, a Ferengi, and a Cardassian (not to be confused with the far more nefarious Kardashians) all alive and battling it out right before his eyes. It's the kind of fantasy mash-up that kids' dreams are made of, and despite its fleeting screen-time, it's a scene that has stuck with me since I was eight years old. 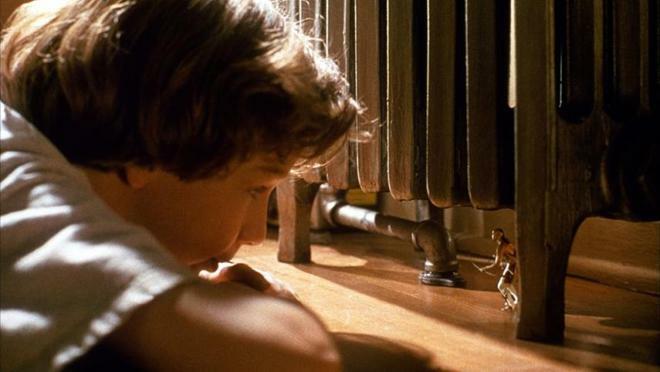 Of course, one memorable tangent really isn't enough to make or break a film, and thankfully Frank Oz's 'The Indian in the Cupboard' is far more than just an excuse to see a Sith Lord briefly take on a dinosaur. Though some elements don't work quite as well now that I'm an adult (more or less), this remains a sensitive family film about friendship, growth, responsibility, and the dangerous power of antique cabinets. After Omri (Hal Scardino) receives an old cupboard as a birthday present from his brother (Vincent Kartheiser, proving that one should never trust a gift from Pete Campbell), he soon discovers that the vintage box has the power to turn plastic figures into living, breathing people. When he places a toy Iroquois named Little Bear (Litefoot) into the cupboard, the Native American comes to life. Confused by his giant surroundings, Little Bear looks to Omri for answers, and soon the child and the miniature man become friends. But when a second toy, a rowdy cowboy named Boone (David Keith), is also brought to life, complications arise that could place them all in danger. Based on the children's book of the same name, the story uses its magical premise to weave a simple yet endearing fantasy tale that tackles some genuinely thoughtful concepts. Through Omri's evolving relationship with Little Bear, the young boy gradually matures, learning valuable life lessons about responsibility. To this end, the movie actually spends a surprising amount of time addressing the child's almost godlike control over his tiny new friends, examining some rather weighty issues related to life and death. 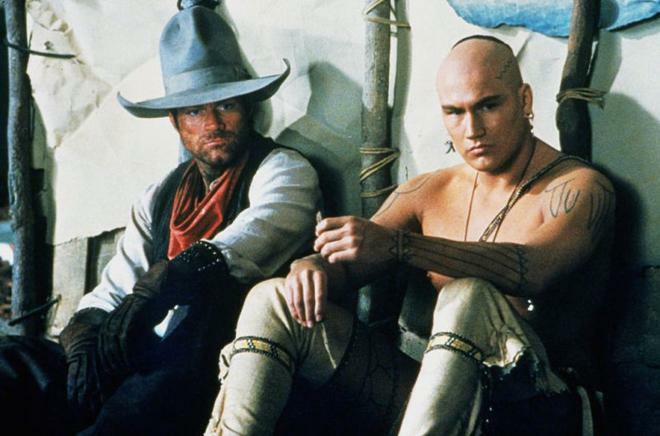 Likewise, once Boone shows up, the script uses the old (and no longer particularly PC) "Cowboys vs. Indians" trope of the American west, to create some solid dramatic tension. This uneasy and potentially deadly rivalry ultimately leads to a few well-meaning observations about diversity and acceptance. These themes are all conveyed through sensitive direction and economical writing, resulting in a quick yet delicate rhythm that focuses on only the essential moments. To this end, by the time the film hits the ten minute mark, the magic of the cupboard has already begun, concisely setting up the story with key interactions and very few diversions. Throughout it all, director Frank Oz maintains a mostly cohesive tone, offering a palpable sense of wonder that still emphasizes character interactions and emotional beats without ever overplaying the fantasy and spectacle. Of course, special effects still play a huge role in the story, and thankfully the chroma key work remains quite convincing, effectively selling Little Bear's miniscule size through careful compositing and tricks of perspective. With that said, the movie's approach is not without some minor stumbles. While the brisk pace is mostly commendable, there are times when certain beats feel underdeveloped or glossed over. This is particularly true of Little Bear and Boone's initial turn toward friendship, which happens very abruptly and mostly off-screen. Similarly, though I admire the lack of narrative fat on display, a little more preamble with Omri and his family would have helped to establish his character's struggles and conflicts early on, adding extra weight to his gradual transformation. On that same note, Hal Scardino's acting is a bit iffy throughout, causing some emotional beats (including the climax) to flounder. Finally, there are times when the film's tone and subject matter actually veer too dark, creating a slightly uneasy sense that misses the intended mark. Case in point: one scene features a tiny, elder Native American who has a heart attack at the sight of the giant little boy who decided to play God and bring him to life. I know we want to see Omri deal with the real ramifications of his actions, but the guilt that must come with accidental murder seems to be rather heavy for a children's flick, doesn't it? Potential manslaughter aside, the movie has held up surprisingly well after twenty years, offering a heartfelt family film. Some aspects of the production don't work as well as others, but through subtle magic and spectacle, the filmmakers are able to weave an intimate coming-of-age story about overcoming differences and accepting responsibility. While 'The Indian in the Cupboard' might not be a genuine classic, it still manages to capture a rare sense of child-like wonder... and did I mention that Darth Vader fights a T-Rex?! 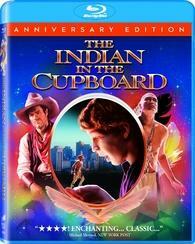 Sony brings 'The Indian in the Cupboard' to Blu-ray on a single BD-50 disc that comes housed inside a keepcase with a cardboard slipcover. After some skippable trailers, the disc transitions to a traditional menu screen. The packaging indicates that the release is region A coded. The movie is provided with a 1080p/AVC MPEG-4 transfer in the 1.85:1 aspect ratio. Mastered in 4K, this is an exceptional transfer that offers an authentic and detailed image. The source is nearly pristine with a natural layer of film grain retained throughout, adding some delicate texture to the picture. Clarity is strong, offering sharp fine details and dimension in outdoor scenes and close-ups, and a slightly softer appearance in indoor scenes that suits the tone of the material perfectly. The color palette is natural with pleasing yet realistic saturation. Likewise, contrast is well balanced with inky blacks and even whites. There is some very slight false contouring during fades, but for the most part, the picture is completely free of any notable artifacts or digital anomalies. Beautifully preserved without any unnecessary manipulation or pesky compression, 'The Indian in the Cupboard' comes to Blu-ray with a stellar catalog title transfer. The film is presented with an English DTS-HD MA 5.1 track along with English SDH, English, and French subtitles. With that said, when played through my PS4, the system and my Pioneer receiver only detected a standard DTS track. On the other hand, when played back on my PC with PowerDVD, the software properly detected a DTS-HD MA 5.1 track. I'm not sure what the issue is here, but it's possible that there is some sort of glitch with this disc and the current PS4 firmware (I've had no problems with any other DTS-HD MA discs on the device). Regardless, as presented through my setup, the mix here is quite solid. Dialogue is clean and clear throughout, but there are times when speech feels slightly overemphasized. The overall soundstage features subtle but effective atmosphere, with music cues and soft ambience hitting the rears. Key sequences, however, offer more aggressive work, including a quick scene with skaters, and two scenes involving Little Bear and Boone fighting, which feature gun shots and swooshing arrows that move around the room. With that said, directionality feels just a tad forced at times (including moments when characters and dialogue move to the left or right) and panning between speakers doesn't always comes across as seamless as it should. Thankfully, Randy Edelman's wonderful score sounds great with wide dynamic range and pleasing separation. While some of the design work can sound a little unnatural, this is a respectable track that adds some sporadic immersion to the film's livelier moments. Sony has provided a decent collection of supplements, including a few Blu-ray exclusive featurettes and a vintage commentary. All of the extras are presented in 1080p video and Dolby Digital 2.0 audio (unless noted otherwise). Director's Commentary – Director Frank Oz sits down for this track originally recorded for the film's DVD release. The filmmaker discusses his initial reaction to the script, casting, sets, locations, and the many challenges faced due to the movie's special effects and bluescreen work. Overall, this is a steady and informative track that offers some worthwhile insights into the production. Frank Oz's 'The Indian in the Cupboard' uses subtle magic and spectacle to weave a heartfelt and sensitive story about friendship, responsibility, and diversity. Some elements of the production miss the mark just a bit, but this remains an endearing family film. On the technical front, the video transfer is fantastic and the audio mix is solid. This anniversary edition isn't exactly packed with supplements, but the director's commentary and retrospective featurette are definitely worthwhile. Nostalgic fans who grew up with the film and new viewers looking for a quality children's flick should both keep this in mind. Worth a look.